One of the great things about being the ED of CASE is my exposure to some great information! Several years ago I met Dr. Reece Petersen, University of Nebraska-Lincoln, when we were both presenting for the CASE unit in Nebraska, NASES. Dr. Petersen was one of the authors of our sister division, the Council for Children with Behavior Disorders' extensive white paper on Restraint and Seclusion. This was back in 2009 and just as Restraint and Seclusion was once again becoming a real issue and interest to legislators and board members. I asked Reece if he wouldn’t be interested in taking the 21 page document and adapting it to the more "reader friendly" Lucky 21 format. He did and we are so proud of our Lucky 21 #3 that resulted from that collaboration. Since then, there have been several opportunities for us to work together. Last spring, Dr. Petersen sent me a couple of brief documents to critique and I was enthralled with the potential of these short, informative briefs. As soon as I completed my assignment, I emailed Reece and asked him to please let me share the information with our membership as I thought it would be so beneficial. He told me then the briefs I was reading were part of the Student Engagement Project at the University of Nebraska-Lincoln which provides resources to school personnel with the intent of improving student behavior, reducing exclusionary discipline and preventing student dropout. You can read more about the Project in a special article below. But what I am so excited about is starting with the Sept 7th update, we will be sharing 2 of the behavior briefs a month! Of course, you can go to the website and download them all, but will you? Maybe ... I hope so as I think these FREE resources are just what our teachers and students need. But then again, I am an "old" EBD teacher at heart! Speaking of free resources... As you start your school year and for some of our students this will be the year to do serious post secondary planning, here are a couple of great resources for your teachers and the parents of these students. I received an email from Doug Jones from AffordableCollegesOnLine about their new guide to resources for students with disabilities. They have also recently published a companion to the above guide focused entirely on financial aid for students with disabilities. This guide details scholarships, grants and other methods students can use to fund their educations. If you know of other great resources for transition planning, post secondary, etc, post them on the CASE Facebook page or email me! Speaking of MORE free resources AND Lucky 21... I started this article out mentioning the collaboration CASE did with CCBD and Dr. Reece Petersen on the CASE Lucky 21 # 3 on Restraint and Seclusion. As you read this update, the CASE Lucky 21 # 7 is being printed! ALL current members of CASE will be receiving a FREE copy of this Lucky 21 #7 once it is completed ... but only members get the FREE copy! Is your CASE/CEC membership up to date? If not, join now and you too will be able to get your FREE copy of Lucky 21 # 7: 21 Points — What all Principals Should Know About Special Education. All renewals and NEW memberships through the month of September will be sent the newest Lucky 21 # 7. So join now! And of course there will be MANY free resources available at the CASE Annual Conference... Registration for the 26th Annual CASE fall conference is definitely a bargain at member price of only $400 considering the price includes all the handouts, lunches on Thursday and Friday, full breakfasts on Friday and Saturday, and Break on Thursday and Friday, and great free resources from vendors, CASE, and networking with your colleagues! We have over 40 breakout sessions; the schedule is still tentative. Be sure to register soon, and to get your hotel room at the Atlanta Hyatt Regency be sure to use the access code: case! Or go to the CASE home page! 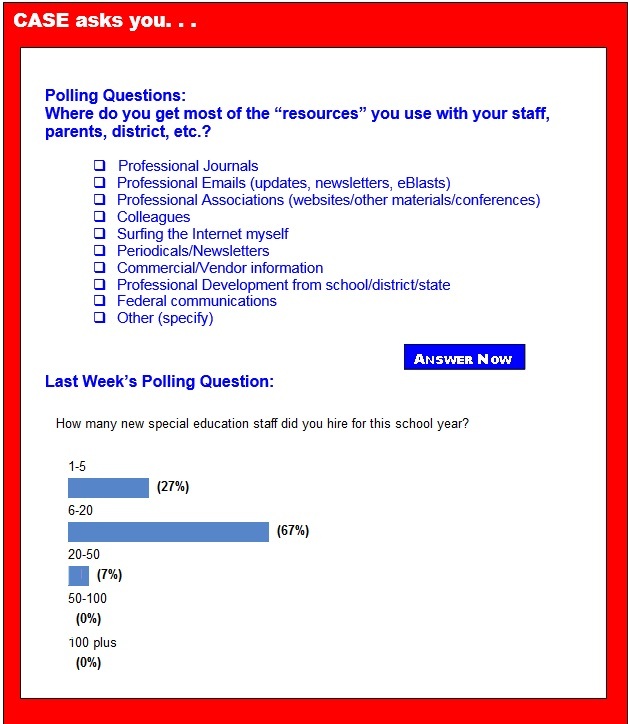 Last week, the Poll asked, "How many new special education staff did you hire for this school year?" The answer that got the most votes at 67 percent of those answering the poll said they hired 6-20 new staff. Second place at 27 percent was 1-5 new staff and at third place at 7 percent was 20-50 new staff. Don't forget to consider using the CASE Career Center and the CEC CAREER Center as you look to fill any upcoming vacancies! Enjoy this last day of August! CADRE is pleased to announce that registration is now open for The Evolving Landscape in Special Education Dispute Resolution: CADRE’s Sixth National Symposium, Oct. 20-22 in Eugene, Oregon. CADRE is very excited to be convening this event, their first since 2011. The Symposium will bring together individuals who are interested in resolving disputes in a productive manner and building collaborative relationships that will lead to better educational programs for students with disabilities. Participants will have an opportunity to work closely with OSEP staff on dispute resolution policies, practices, and procedures, and will hear from Michael Yudin and Melody Musgrove about the importance of developing high-performing dispute resolution systems. Workshops and sessions of potential interest to local education agencies include: The IEP/IFSP Facilitation Journey: Facilitator as the Guardian of Team Collaboration with Chairperson Support; IEP Meeting Facilitation — Using Facilitation to Change District Culture; Making School Resource Officers a True Resource for Students and Families with Disabilities; Creating Change: Student-Led IEPs as a Dispute Resolution Option; Informing Whole School Climate: Lessons Learned from Effective IEP Meetings; Innovations in Local-Level Dispute Resolution Systems: A SELPA Case Study; Collaborative Practices Between Districts and Stakeholders to Enhance Dispute Resolution and many, many more. The Student Engagement Project at the University of Nebraska-Lincoln provides resources to school personnel with the intent of improving student behavior, reducing exclusionary discipline, and preventing student dropout. Project staff have created a multitude of “briefs” which provide educators a quick overview of a wide range of strategies to accomplish these goals. The briefs define the strategy, identify the status of research and related literature on the topic, and its tier of intervention in a multi-tiered system of supports. They are intended to assist school teams focused on individual students, as well as school improvement teams developing school-wide plans which could incorporate components based on these topics. The briefs are intended to be short and practitioner friendly. Forty-eight strategy briefs, eleven program briefs, seventeen policy documents, and three documents on behavior screening and dropout early warning signs are currently available, with others still being created. All strategy briefs are free and other documents can be downloaded at http://k12engagement.unl.edu. The CASE Weekly Update will be spotlighting one of these Strategy Briefs about twice a month. Your new teachers need nurturing through every stage of their professional growth — help them survive and thrive in their classrooms with two new publications from CEC. Give them the how-tos they need to get through their first year with "The Survival Guide for the First Year Special Education Teacher" and prepare them for their entire career with CEC's famous Red Book, "What Every Special Educator Must Know: Ethics, Standards, & Guidelines." These books are coming in October, so pre-order now — use the code SURVIVETHRIVE at check-out to save 15 percent! P.S. — Buy them as a set and save even more! The U.S. Department of Education is doing away with a policy that allowed states to consider some students with disabilities academically proficient without meeting grade-level standards. The agency said in a final rule published in the Federal Register that states will no longer be allowed to administer tests to students with disabilities that are based on modified academic achievement standards. Previously, states could count up to 2 percent of their students as proficient under the No Child Left Behind Act for taking such exams. But now the Education Department is saying no more to the policy known as the "2 percent rule." The first time Lincoln High School senior Emery Roberts realized she was different was in kindergarten. She and a "frenemy" were neck-and-neck in a reading contest. Emery even remembers which book proved an insurmountable hurdle; it had a tiger on the cover. "I remember it very specifically," says Emery, founder of the LHS Dyslexia Student Union. "I didn't pass that book for months." The 17-year-old, who wasn't diagnosed with dyslexia until the end of fourth grade, will graduate soon with a high GPA and a substantial amount of private tutoring under her belt. She's hoping that the next generation of Portland Public Schools students will have an easier time of it than she did. Two bills passed during the 2015 Oregon legislative session should help. Nearly half of minority students and students from low-income families enter the fifth grade without basic reading skills, according to a new report urging Congress to focus on students' literacy development beginning in early childhood. Noting that 60 percent of both fourth- and eighth-graders currently struggle with reading, the report from the Alliance for Excellent Education notes that Congress should put an emphasis on students' literacy development from the early years and up through grade twelve as it works to rewrite the No Child Left Behind Act. Can musical training help overcome dyslexia? David Ludden Ph.D., a contributor for Psychology Today, writes: "Did you hear the one about the dyslexic agnostic who lay awake nights wondering if there was a dog? I first encountered this joke in a biological psychology textbook I used more than a decade ago. Yet the author's attempt at comic relief reflects a prevailing misunderstanding about the nature of dyslexia. Developmental dyslexia is a reading disability that cannot be accounted for by visual or cognitive deficit nor by a lack of opportunity to learn. It affects an estimated 5 percent to 17 percent of schoolchildren, depending on the cutoff reading score used to diagnose the disorder." The School District of Philadelphia is facing a lawsuit alleging that thousands of children are denied special education services due to a lack of translation and interpretation services for families that don't speak English. The class action suit was filed in federal court. Plaintiffs are represented by the Education Law Center, the Public Interest Law Center, and the private firm of Drinker Biddle & Reath LLP. District spokesperson Fernando Gallard said it is the District's practice not to comment on active legal cases. The complaint says that the District repeatedly fails to translate documents in a timely manner so that parents can participate in meetings concerning their child's Individual Education Plan, or IEP. How do we get young children to accept differences? First, we have to recognize that for many young children, "differences" are disconcerting. Even though a pre-K or kinder student may not be able to articulate it, they are often put off by differences. Sometimes it's because they can't explain what they perceive. Other times, they are not sure of the implications of the differences and may fear for their own safety. Student engagement at school and whether students feel hopeful about their future are far better factors to consider when evaluating schools than using standardized test scores, according to the results of the 47th annual PDK/Gallup Poll of the Public's Attitudes Toward the Public Schools. Overall, most Americans believe there's too much emphasis on standardized testing in public schools, and they rank standardized testing lower than other approaches to measuring student progress such as examples of student work, grades awarded by the teacher, or written observations by the teacher. As we prepare this August for the start of another academic year, it's important to acknowledge an often invisible, seldom-talked-about population of students: young people who are recovering from mental-health disorders and are transitioning back to school after a time away. Mental-health challenges in young people are common, and they create major barriers to learning. But as is true with adults suffering from such problems, the young can and do recover — even those with serious challenges. As educators, we can provide critical support in their recovery and help them as they work to integrate back into classes and get on with learning and with life. A tiny study of 40 high school students in Chicago perked up some ears recently. It found that a small amount of musical instrument instruction — only two to three hours of band class a week — improved how the teenage brain processed sound. Neuroscientists from Northwestern University made the case that the kind of brain maturation they documented was not only important for becoming a better musician, but also for developing non-musical verbal skills.